The concept of punching designates a slitting process in which a sheet is severed in one stroke while shapes such as round holes are created in the part, and external contours are cut with single strokes. Punching specialist Trumpf takes a swing at explaining the methodologies and innovations of punching. 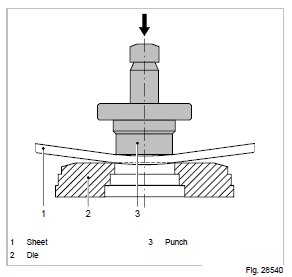 Punching works exactly the same way: the sheet is positioned between the punch and the die. The punch moves downward and plunges into the die. The edges of the punch and the die move past each other in parallel, cutting the sheet. Observed in detail, the punching process proceeds in four phases. When the punch touches the sheet, the sheet is deformed. Then it is cut. Finally, the tension within the material is so great that the sheet breaks along the contour of the cut. The cut-out piece of sheet – the so-called punching slug – is ejected downward. When the punch travels upward again, it can happen that it pulls the sheet along. In that case, the stripper releases the sheet from the punch. The higher the fraction of cut on the sheet edge, the better the edge quality. For precise fits, for example, preliminary holes are punched and then the final diameter is punched out with a slightly larger tool. The fraction of cut along such an edge is then as high as 100 percent. But nowadays punching technology has evolved to much more than just simply “making a hole into a sheet”. Users are thinking many steps ahead and to combine or avoid secondary processed with the first stroke of the punching head! – How to avoid scratches on the material? – How to avoid any deformation of the material? – How to combine secondary processes into the punching process? The basis for scratch-free processing is the use of brush tables. The brushes provide soft support to the sheet which prevents scratches. During positioning, the sheet slides of the brushes, which, due to their length, bend in the direction of movement. Another advantage of the brushes is that dirt particles fall between fibre bundles instead of the sliding surface and event preventing the transfer of particles onto the following sheets. Further advantages of the brush tables are noise reduction during production. Protecting the punching tools will also lead to a protection of the sheet when the materials interact during the punching process. For example adhesive, pre-formed and self-stick polyethylene pads can be attached to dies, strippers and intermediate rings to prevent scratches. 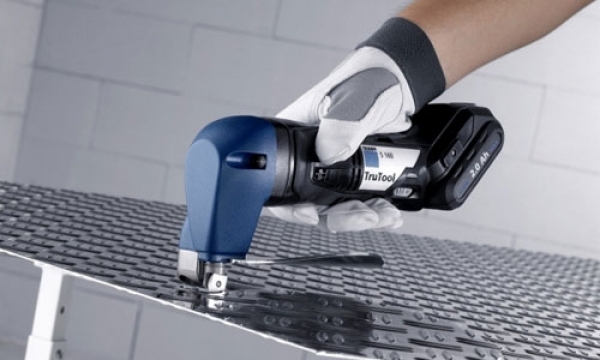 Such adhesive pads are a simple and economical solution to improve workpiece surface quality. The usage of a specially coated stripper can virtually eliminate any imprints on the material and thanks to its smooth and dirt repellent surface, the coating is wear-resistant and keeps material abrasion chips from sticking to it. The punching dies also can be protected for example with Ampco. Ampco is a soft alloy that avoids scratches on the bottom of the sheet because of its softness and lubricant effect. Especially in the case of intermediate rings, the Ampco solution offers outstanding results in the prevention of scratches. An additional possibility for reducing scratched is the use of brush inserts in dies and intermediate rings. Since the brush inserts are about 1mm higher than the upper tool edge, they prevent direct contact of the tools surface with the sheet to be processed. Thus, there is no longer a danger of catching when forming downward. An active die offers all of the advantages as the descending die, but in addition, the active die operates as a second punching head able to perform an active forming stroke from below. 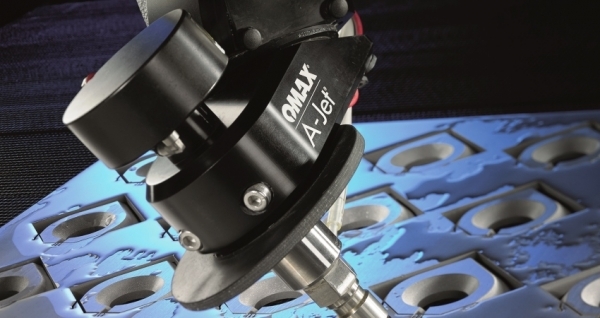 This broadens the range of processing strategies and tool usage as well as enables new forming sizes and heights. The sheet is no longer lifted by the tool, but rather lies always flat on the machines. This enables forming closer to the clamps and thus better material utilisation. When buying the sheets, the evenness is defined according to DIN EN 10051 or DIN EN 10029. Additional deformations can arise when machining the sheet on a punching machine. 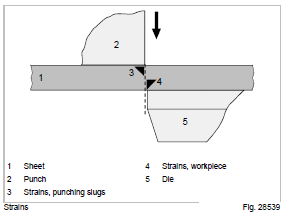 The degree of deformation increases with the number of punching operations on the sheet. This results in a loss both in quality and accuracy, requiring refinishing (straightening) and, in extreme cases, a risk of collision at the machine between the sheet and tool. For this reason, it is imperative that the sheet be kept as flat as possible while it is being machined. 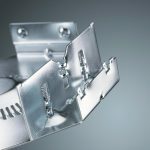 When punching sheet metal, compressive and tensile forces are created in the workpiece by the punching process, and these, in turn, lead to deformation. In the standard punching process, the punch draws material into the hole as it penetrates the sheet. That makes for compressive and tensile stress when the punch is withdrawn. Especially when working low-gauge sheet metal with many holes, the material can become deformed. The result is a wavy sheet which will have to be flattened in a separate machine before processing can continue. With the integrated flattening, this extra step is no longer necessary as the function induces opposing stresses. Thus it ensures undistorted sheet metal panels and in this way shortens the entire working process. The central components in integrated flattening are the punching tools made by Trumpf. A convex die and a stripper with a recess and special coating make sure that the sheet metal isn’t deformed. The convex die presses the sheet metal, from underneath, against the stripper; the sheet metal is over-bent at this point. The concave stripper counteracts by pressing the sheet metal, raised by the convex die, back downward at the edge of the die. The overbending of the materials creates counter-stresses which offset the compressive and tensile stresses caused by the punching process. In this way the stresses are compensated and the sheet metal is flat when it leaves the machine. The sheet may become deformed due to strains induced by the punch and die in the immediate proximity of a punching operation. These strains do not spread to the entire sheet. During the punching process, the material is “compressed” by the punch and die, until the punching capacity is great enough for the slug to break through the die. However, the strains that such “compression” produces in this area of the sheet persist, resulting in deformation. 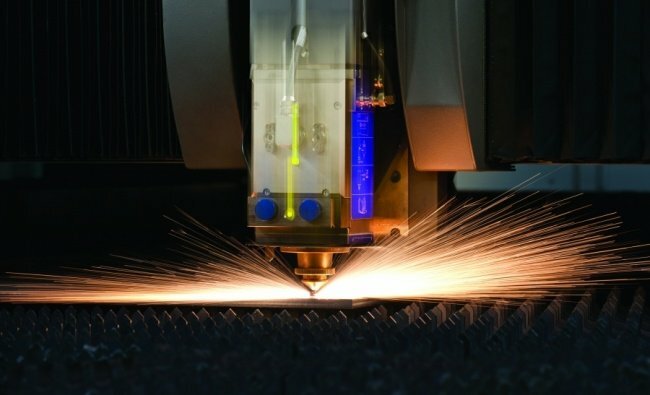 As tests at Trumpf have shown, the sheet becomes flat again if the area of strain (approximately 1 mm for sheets with material thickness of 2 mm) is removed by laser cutting. • Hard material (stainless steel). • Dies that are too small or too large. Another cause for deformation is the bowing of the sheet between punch and die during machining. This again results in strains. 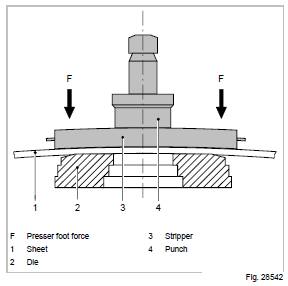 Selection of suitable punches and dies: The punch must be ground very sharp if the punching force (and consequently the deformation) is to be reduced. Tests have shown that both too small and too large a clearance between punch and die lead to increased deformation. A die which may be ideal for minimising sheet deformation can however, in unfavourable situations, result in burr formation at the sheet edge. 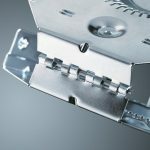 Use of the presser foot: Sheet deformation is reduced when the presser foot (stripper) is used, because the presser foot holds the sheet flat down while it is being machined. Arching over the sheet: This method reinforces the effect of the active presser foot. To do this, the presser foot (stripper) must be able to arch a little over the die. In the process, the sheet is “straightened” by the stripper which bows slightly at its outer ends. A flat stripper is used in this method, with the normal clearance between punch and stripper (approximately 1–2 mm). 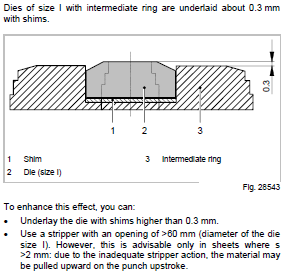 Chamfering the die: In cases where the die cannot be underlaid with shims (e.g. for dies of size II), the die can be chamfered to a pyramid shape. The die is ground off 0.3 mm with the aid of a tool grinding machine. 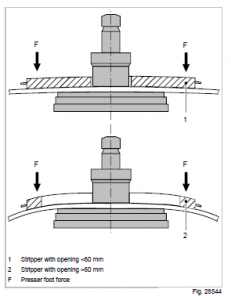 In this process, the die is shimmed in the grinding adapter on one side and ground down except for an area of 3–5 mm around the die opening; it is then turned 90° at a time and ground again in that position. The result is a die with four evenly bevelled faces. 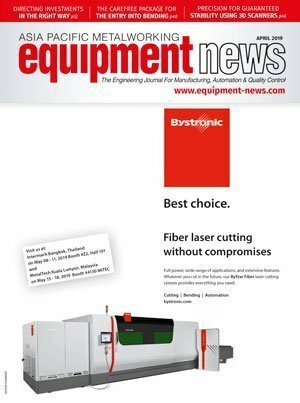 Rising expectations in sheet metal processing are triggering demands for wider options in joining techniques. 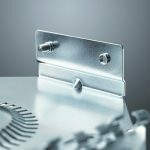 With the help of the right tools, a great variety of connectors can be made up right at punching and combination machines. 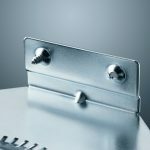 From sheet metal screw fittings on the front surface to click connections and even hinged joints secondary processes in the manufacturing process can be combined with the initial punching process. 1 Sheet metal threads Special reshaping is necessary for preparation of multiple sheets for fastening with the help of sheet metal screws. The thread punch tool is used especially when dealing with thin sheet metal. A hole is punched in the first step and in a second step the threads are tapped. 2 Threads Creating threads in a punched hole or extrusion are referred to as tapping. When a tapping tool is used, this reshaping can be done right on the machine. No chips are created, since the material is displaced and not cut during the procedure. Advantage: The displacement process itself lends great strength to the threads. 3 Threads at the front face A connection often found in housings and plant constructions uses sheet metal screws at the outside face of the sheet metal. Such joints can take either sheet metal screws or metric threads. 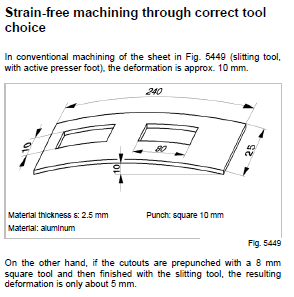 The new PunchGuide written by Trumpf makes the calculations involved with punching easier than ever before. That mechanical engineering company, located in Ditzingen, Germany, has packed its comprehensive expertise in the field of punching technology into this practical app, designed for use with smartphones or tablet PCs. The PunchGuide app puts the most important parameters at the fingertips of work schedulers, engineers and operators. 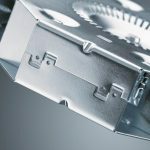 They offer support for a variety of calculations including punching force, cutting clearance, pre-punching diameter, maximum edge length, stripper selection, calculations for sheet metal thickness conversion and sheet weight. It is easy to specify whether results are to be output in metric or imperial units of measure. To arrive at the desired result even faster, users can store data for their own machines in the app. This mobile app can be obtained in versions for German, English, French, Italian, Spanish, Czech and Chinese. It is available immediately, at no charge, for the iOS and Android operating systems as well as in a Web version. With the new integrated tool management system customers can also better organise their punching tools and, in this way, reduce the times needed to search for tools and to set up the machine. To do this, they connect the components involved in the set-up process, including machinery and grinding devices made by Trumpf, with a central database and manage tools there by way of a data matrix code. Today’s waterjets can cut much faster than CNC mills and wire EDM machines, and with high precision. But it is not only the cutting speeds and tight tolerances that make them so attractive. By Dr John H Olsen, vice president of operations at Omax Corporation.